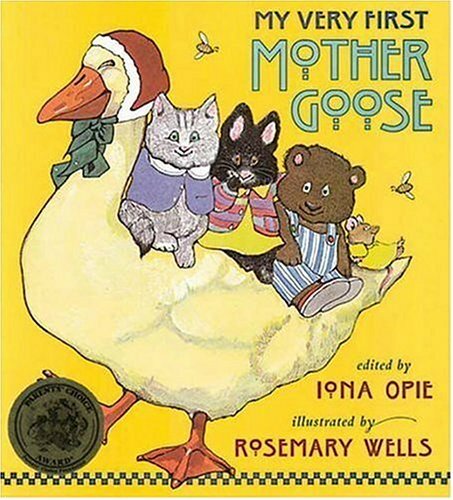 "Mother Goose Time" resumes at my library tomorrow. It's a program for 12-24 month olds, and I look on it as a teaching program. It's intended to teach parents and nannies (lots of those) rhymes and games to play with their children to increase language development. Of course, a lot of parents use it as a free program to add to the "schedule" of events their children attend weekly either with them or with the nanny, and I really feel sorry for those of them who miss the point. Because you don't, don't, DON'T need a formal program to use these rhymes, and they were made for life on the go. These are the rhymes and games I played with my daughters when they were little. They were rhymes that we played and songs that we sung in the car, in the bathtub, at the doctor's office, in a restaurant and above all, at night before bedtime. It wasn't an earnest attempt to "increase language development", or turn my kids into little geniuses. It was play. It was FUN! And how I miss it! It never fails to surprise me how many people don't seem to understand this sort of play with their kids. 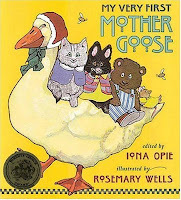 Way before I was doing "Mother Goose Time" I was sitting with SC on my lap as the two of us poured over the pages of the Rosemary Wells illustrations in this book. BTW, this is still my favorite Mother Goose book because it has big clear UNFUSSY pictures with well chosen versions of the rhymes. The Jan Brett/Mary Englebreit sort of school of art is fine for grown-ups and bigger kids, but it's too cluttered and complex for toddlers! That book is still in our house, though it is worn and shabby after going through both SC and her little sister JR. SC will not part from it and one day (in the far, far future, I trust!) I think it will pass on to the next generation. And I have the gift of wonderful memories of time spent with my girls that I try to pass down to my families at Mother Goose Time. Hopefully, some of them get that!